Toyota understands a world-class hybrid needs first-rate technologies for both combustion and electrification. So it should come as no surprise that since 2001, Toyota has earned more 10 Best Engines trophies for hybrids (six) than any other automaker. Over the course of 18 years, Toyota has earned its stripes as commander of the hybrid battlefield. Its latest offering in the Lexus UX 250h luxury crossover is yet another groundbreaking execution of a gasoline/electric powertrain that is silky, noise-free, efficient, fun to drive and a Wards 10 Best Engines winner. The heart of this vehicle is the 2.0L Dynamic Force 4-cyl. high-compression (14.0:1) engine (codename M20A-FXS) that achieves 40% thermal efficiency and relies on both port and direct fuel injection. Consider it a sibling to the 2.5L engine that helped the Camry Hybrid earn a 10 Best Engines trophy last year. A third electric motor-generator embedded within the rear differential provides standard all-wheel drive in the hybrid UX at speeds up to 43 mph (69 km/h). The vehicle’s anti-skid stability control system distributes power between the front and rear axles when accelerating, cornering or on slick or steep surfaces. Total output from this powertrain is 181 hp, which is plenty for a vehicle this size. We enjoyed the turbo-like punch from the 24-kW nickel-metal hydride battery, while noticing an impressive 38 mpg (6.1 L/100 km) during our test drives. WardsAuto editors marveled at the UX 250h’s linear acceleration and unobtrusive stop/start system. 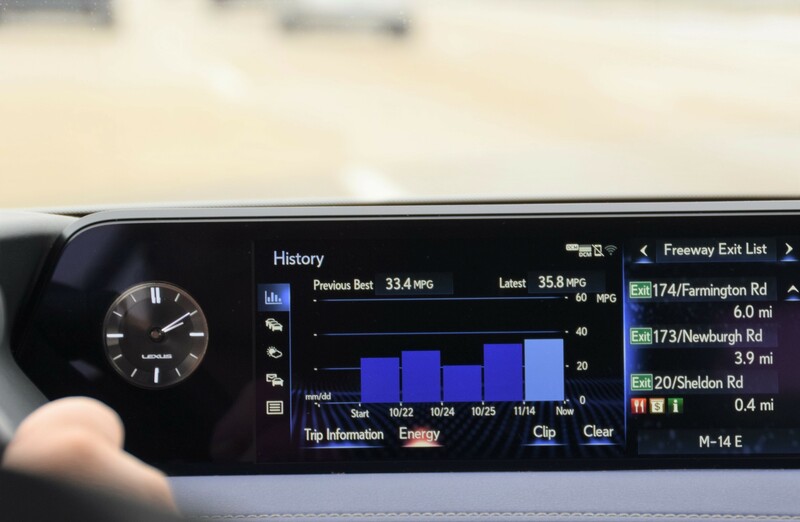 Toyota says the new Lexus hybrid can run at speeds up to 71 mph (114 km/h) without burning a drop of gasoline. Even without electrification, the new 2.0L 4-cyl. represents state-of-the-art internal combustion. Eccentric-barrel oil rings (a technology borrowed from Toyota racing engines) reduce oil consumption, and the intake-valve angle has been increased for better flow and tumble of air and fuel in the cylinder. Innovations include a crankshaft that’s 12% lighter than the one it replaces and high-strength connecting rods that are 28% lighter. The block was made more compact by eliminating a water jacket and replacing it instead with a 7-mm coolant path in between each cylinder. Also new for the 2.0L engine are piston skirts incorporating crosshatch grooves that are laser etched to reduce friction by maintaining oil film thickness. Plus, the engine has a variable cooling system that pairs an electric water pump with an electronic thermostat for improved efficiency. Clearly, Toyota understands a world-class hybrid needs first-rate technologies for both combustion and electrification. So it should come as no surprise that since 2001, Toyota has earned six Wards 10 Best Engines trophies for hybrid vehicles – more than any other automaker. With a starting price of $34,000, the UX 250h is an affordable, upscale hybrid that happens to be America’s most fuel-efficient utility vehicle without a plug. Some WardsAuto editors topped 36 mpg while testing Lexus UX 250h for 10 Best Engines.